A tie-in to the crossover event Forever Evil! The Rogues - the Flash's gallery of villains - call no man boss, but a new evil threat might not leave them much choice! Will they fall in line, or refuse and risk certain death? Will the Rogues be able to take on the Crime Syndicate together? Written by The Flash scribe Brian Buccellato, Forever Evil: Rogues Rebellion brings the Scarlet Speedster's infamous foes into unfamiliar territory: as heroes. 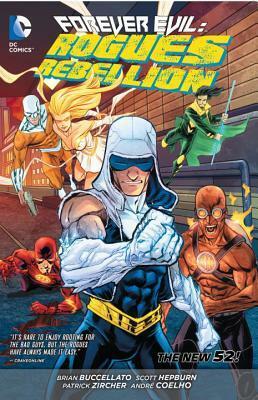 It collects Forever Evil: Rogues Rebellion numbered 1-6, and The Flash number 23.1 and number 23.3.